It’s been two and a half years since I packed up my little red car, left Ohio behind for the third time, and drove the 18 hours to Austin. At the time, more than anything else, I was following a burning desire to demystify the one city that has always enchanted me. I pictured a sunny hippie oasis that would wrap me in its colorful scarves and allow me to leave the sterility of the legal world behind. And while Austin has exploded to become much more than the one-horse artist’s town it once was, in a lot of ways, if you know where to look, it retains that mystical charm. I share this with people who ask me why I ended up here. The question constantly arises, as if the idea of moving to another state for no practical reason is hardly enough. And after living here for over two years, it seems pretty obvious why I’m here, and why I want to stay awhile. When you feel the sun on your skin in Texas, it’s just different. Hotter yes, but richer too. You can feel it seep into you like syrup on a pancake, and it can leave you feeling almost drunkenly alive. In Austin, the live oak trees, huge and green and sagacious as they are, are protected as fiercely as children. Recycling is a given. Yoga is a necessity. Folks make their own almond milk and grow their own herbs and bring their dogs absolutely everywhere. A healthy meal is always a stone’s throw away. When you walk into a restaurant, or a juice shop, or wander down a trail, or through an art show here, just about every person seems to be on the same page. Young, but not that young. Hungry, but discerning about their food. They have sun kissed cheeks and real smiles; they want something more from not just life in general, but from that very moment. And most of the time, new friends– ones that aren’t always similar to themselves–and new experiences are always on the to-do list. People sweat here, and it’s more often on purpose than due to a 40-step walk from their car. People let things go, only to let better things in. I do recognize that these are gross generalizations, that you can find every type of person here, and that many places on this earth offer these same amenities and glories. I have watched numerous friends or coworkers move here only to feel unfulfilled, unsatisfied, or unimpressed. And I’ll admit, Austin is not for everyone. There are plenty of reasons to visit, to taste its youth elixir, only to turn around and head back to colder, more familiar places. So, people ask, won’t we be doing that one of these days? Won’t we wake up in Neverneverland and realize that we belong back in the Midwest with our beloved families? My answer to that is this: there is a richness in Austin that we are in no way ready to leave, and that richness, more than anything, comes from the friends we have made and kept– the family we have created–since our arrival. And though I miss my family so much, it is that richness, that figurative wealth that I feel, that will keep me in Austin for the foreseeable future. When I moved here, a month before Marc did, I had no other choice but to seek human connection with every fiber in my being. As a true extrovert, it only takes about 4 hours alone to drive me absolutely off-the-walls insane, and at that point I’ll have a conversation with my front door. Lucky for me, my first few months here drew in some of the best people I’ve ever met in my life. I spent this weekend with one of those friends, the same one I wrote about on this blog over a year ago, the one who ate pasta and bread and olive oil with me and left me feeling that I had just gained a true partner in (carb) crime. Andrea brought one of her friends, Sam, a woman I’ve known for a while but haven’t truly had the pleasure of friend-dating. 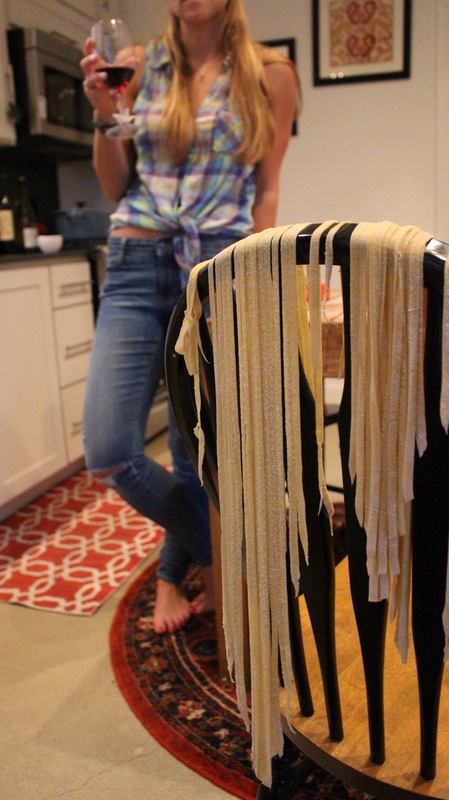 And as Hurricane Harvey blew his way through Austin, we all gathered in my little house and made pasta. With our hands. 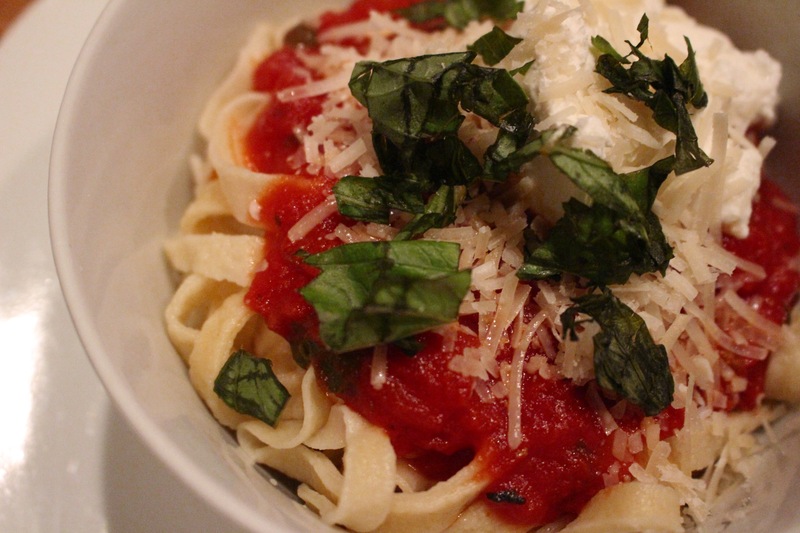 This was my first time making pasta from scratch, and I’m entirely ashamed to admit that. 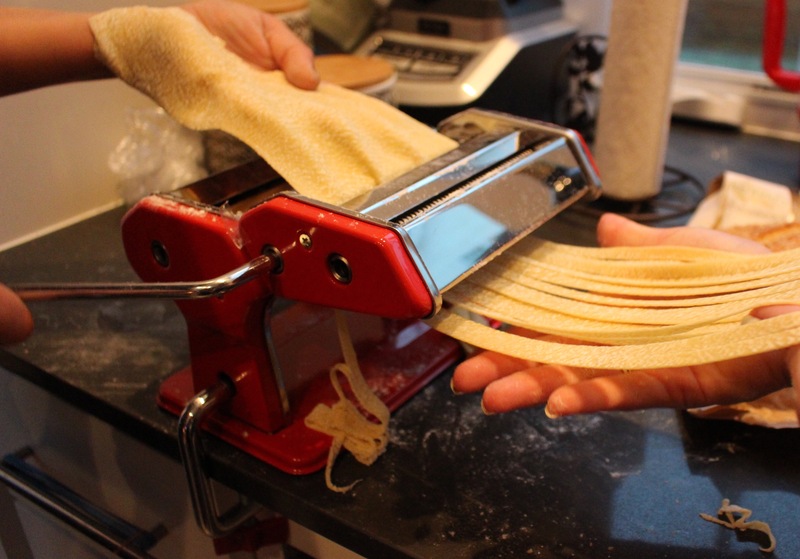 My great grandmother rolled out pasta dough by hand and cut the noodles with a knife, on the reg, and yet I’ve never had the gumption to get up and do it myself. Andrea, her own Italian roots shining through, helped me swirl the eggs into the flower on a parchment-covered table top, her long pink nails peeking through the floury mess on her hands. 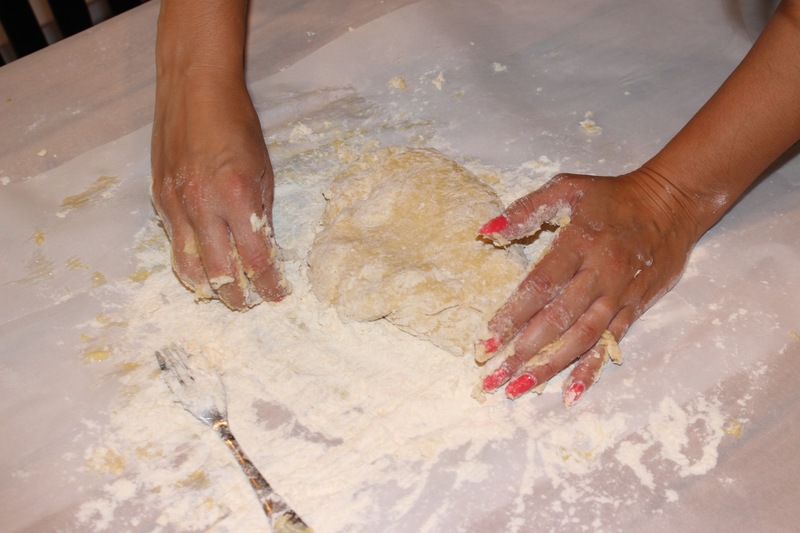 We took turns kneading the dough, rolling it out and balling it back up, playing with the flour until the consistency felt just right. The three of us drank Montepulciano and Nero D’Avola and Cabernet Franc as we let the dough rest, and in the process of making something new, I managed to not only make a new friend, but become even closer to one I already had. We rolled the pasta dough using a simple pasta roller (compliments of my little sister), and I have to say that I was floored by the ease of it. I wasn’t stressed–Andrea and Sam are very capable in the kitchen, which helped–I did not feel rushed, and maybe it was the wine, but I enjoyed every millisecond of the whole thing, of cooking with other people. The only other people on this earth who make me feel that way are members of my own immediate family. We gently grasped the long noodles as they emerged from the roller and laid them over the kitchen chairs, just like my great grandmother did. Though not new to Andrea, this was new to Sam too, and I found myself almost giddy at how natural it all felt — how familiar. Since we’ve met, Andrea and I have forged one of those adulthood friendships that make the 27-odd-years we spent apart feel nonexistent. We still have a lot to learn about each other; until last night, I knew nothing about her skills with a rolling pin, for example. We weren’t flung together by any kind of typical construct (college, job, etc.) but instead made an active effort to become friends and remain friends. When I stood up at her wedding several weeks ago, surrounded by women she had known much longer than me, I felt that overwhelming kind of love, the kind we reserve for only the closest relationships. The pasta turned out more outstanding than I could ever imagine. Somehow cooked to a nice al dente with only a couple of minutes in boiling water, the noodles had texture and consistency and a richness of flavor, even before being covered with sauce and cheese and fresh basil. The process took a while, but that’s the beauty of good friends. I hardly noticed. By next April, Andrea and I will both have married and purchased a home, all within the same year. We will have reached the three-year mark in Austin, exploring every tired attraction and unknown treasure we can find, hanging on to this city as our own, even as our families look on from hundreds of miles away. The connection I feel to Austin would not be anywhere near as strong without her or the other amazing people that I get to call my friends. I may not have roots here, but I’m crafting them myself, from scratch. I’m fully prepared for the recipe to fail me, to feel homesick for a real autumn or a first snow, to wish I was closer to my parents and my sisters. But for now, I am letting this city wrap me in those colored scarves and save me from the expected and the ordinary. And I’m out-of-control lucky that I have the closest possible thing to family right here, under the same Texas sky.